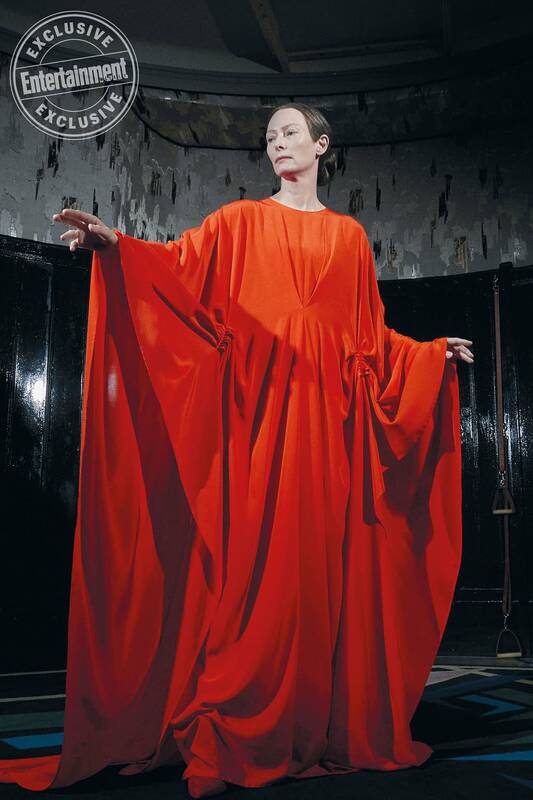 Tilda Swinton is head witch in charge at the dance school in Suspiria. That doesn’t mean she doesn’t have reservations about what’s going on in this school, though. Director Luca Guadagnino told Entertainment Weekly that this is a woman torn between two very passionate things. We have a new image of Swinton rocking an extremely orange cloak, and anyone who thought that this movie wasn’t going to have color like the original is probably biting their tongue with these recent images. As for star Dakota Johnson, she had nothing but good things to say about her co-star. This movie gets more interesting the more we see of it. Summary: As a darkness builds at the center of a world-renown dance company, its artistic director, a young American new to the troupe , and a grieving psychotherapist become entangled in a bloody, sighing nightmare. Suspiria, directed by Luca Guadagnino, stars Chloë Grace Moretz, Dakota Johnson, Tilda Swinton, Jessica Harper, and Mia Goth. It will be released November 2nd.